Kildrum Tigers and supporters celebrate their league title triumph. Damien Crossan scored the all important goal to clinch the title and and end a 17 year famine at Station Road. Kildrum, the leaders for so long in the Premier Division, had watched as Castlefinn went on a brilliant run to bring the race for the title down to the final day. The Tigers only needed a draw to seal the deal while Castlefinn had to win. Crossan struck late on, finding the net after Kevin McHugh's initial strike was parried by Castlefinn keeper Chris O'Donnell. The goal cancelled out Shane Gallagher's glancing header on the hour mark. 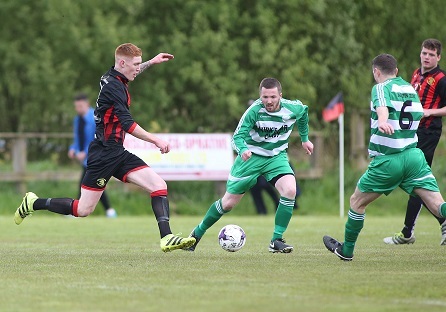 Daniel Clarke of Kildrum Tigers controls the ball as Peter Bryson of Castlefinn Celtic closes in. That goal nudged Castlefinn towards what would have been a first ever Premier title. And as the minutes ticked down, the large travelling support were hoping that their team would hold out. 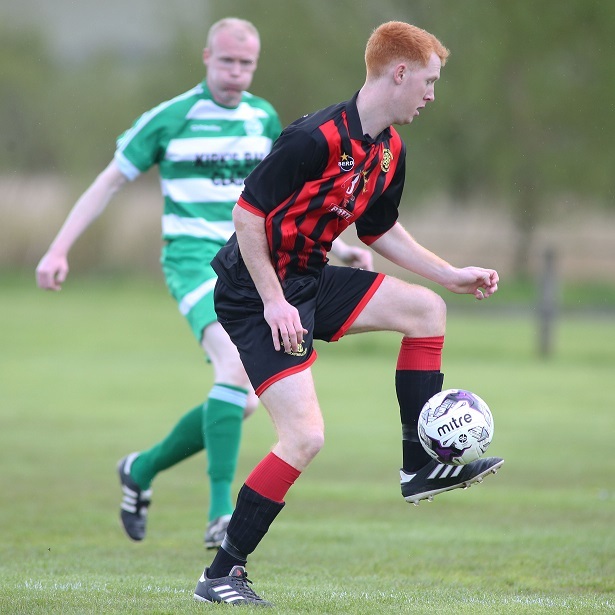 But those hopes were dashed when Crossan's goal ensured Kildrum finished their league campaign unbeaten, and more importantly, as league winners. Played in front of a big crowd, Castlefinn had the opening chance when Shane Gallagher's goalbound effort was blocked, amid appeals for a penalty. Sean Friel in the Kildrum goal had to be alert to push a Raymond Foy free-kick over the bar as Casltefinn pressed again. Ian Ward also went close just before half time, firing just wide of Friel's goal. They eventually hit the front just before the hour when Foy's free was glanced home Gallagher. But with time running out, Kildrum struck a dramatic late equaliser when Crossan p0unced to score, sparking wild celebrations among the Tigers contingent. KILDRUM TIGERS: Sean Friel, Jamie McKinney (Oran Higgins 78), Brian Coll, Jonny McGinty (Tristan Ferris 75), Michael Lynch, Gary Crossan (Brett McGinty 62), Daniel Clarke (Gareth Colhoun, 71), Damian Crossan, William Lynch, Kevin McHugh, Jonny Carlin (Darren Doran 78). CASTLEFINN CELTIC: Chris O’Donnell, Gary McNulty (Brian Dooher 92), Peter Bryson, Emmett White, Damien McElhinney, Johnny Doherty (Matthew O’Rourke 84), Ronan Tourish (Barry Tourish 47), Raymond Foy, JP Malley, Shane Gallagher, Ian Ward. Kildrum's Jonny Carlin faces the Castlefinn Celtic defensive duo of Gary Mc Nulty and Johnny Doherty.